Residents of Knowlton noticed some large machinery working at the corner of Victoria and Lakeside and the large circular cement cutter had many people wondering if repairs were being done to the water lines or perhaps some work on ancient building foundations. 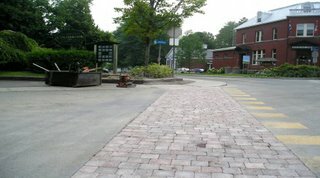 Actually, the reason for the modifications to the streets was that new cobblestone crosswalks are being added to Knowlton. The charm of old fashioned cobblestones ill fit in perfectly with our charming Quebec village and visitors will no doubt appreciate the addition! The terrasse of the Star Cafe which is typically filled with tourists and locals enjoying a tasty treat and a fine coffee had a large group watching as the workers from the Town of Brome Lake sliced into the roadways and brought in the forklift to haul the pallets full of fresh stones and then packed them by hand into place. Someone on the street who was watching commented that the new cobblestone crosswalk was set into the road right where the yellow painted crosswalk markings had recently been painted but there was still the yellow crosswalk showing on one side and thought it was not so nice looking. His friend who was sharing a leisurely morning coffee on the deck of the Star Café reminded him that soon the paint would fade and he should get back to eating his muffin! The crosswalks across from Knowlton Academy have also been changed and other corners in Knowlton will soon be seeing the latest improvements brought about by the mothers and fathers of the municipality of Lac Brome. Many residents of Knowlton have expressed concerns over traffic not stopping for pedestrians at crosswalks and it is hoped that the lack of visible painted lines will not increase the risk for our pedestrians. We all appreciate the old-fashioned look of the new cobblestones and it will be a welcome cosmetic addition to our historic village!